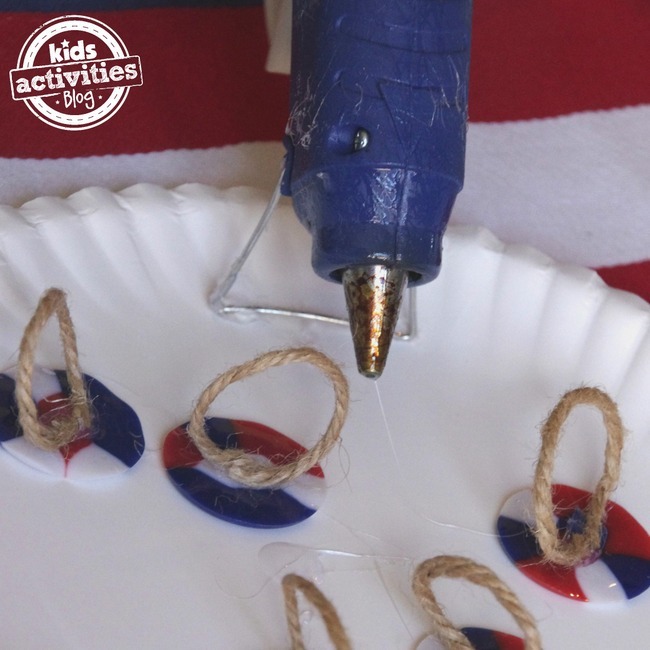 Kids can easily help make Fourth of July melted pony bead decor for your own Independence Day celebrations. 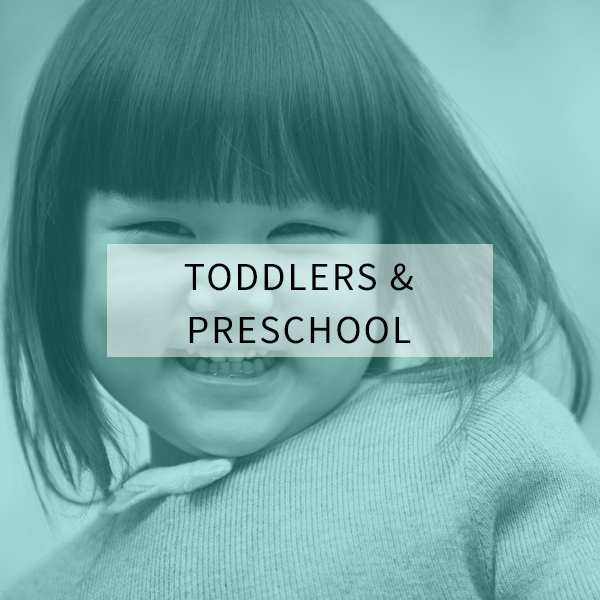 They will love being involved in the decorating process. 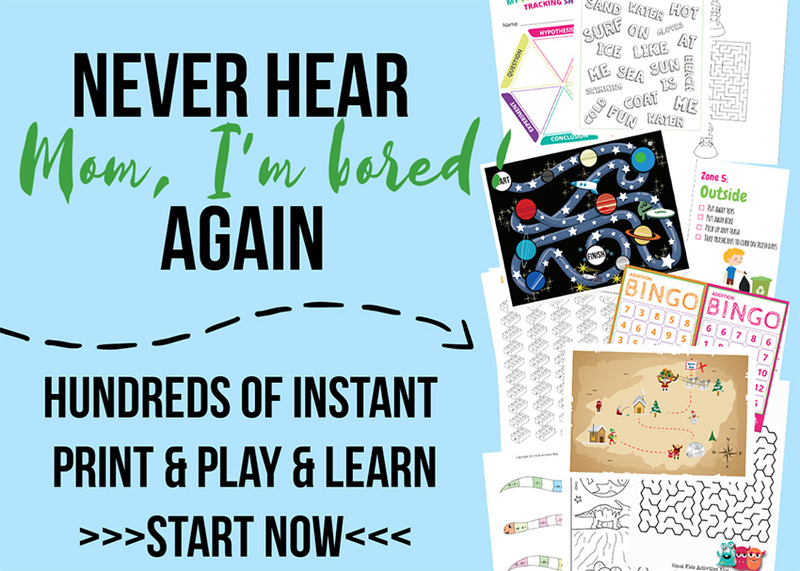 Pony beads are great and are traditionally used to make jewelry, but you could also make something unique like our creative pony bead abacus. I was inspired by the Artful Parent and her pony bead sun catchers. 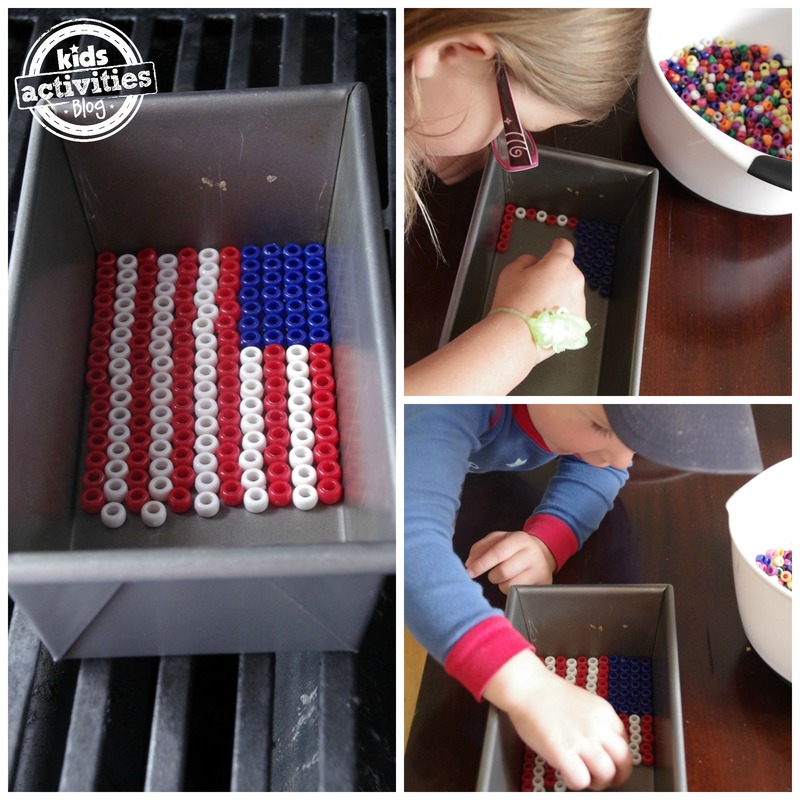 I thought it would be fun to take the technique of melted beads to work with my kids to create our Fourth of July decor. 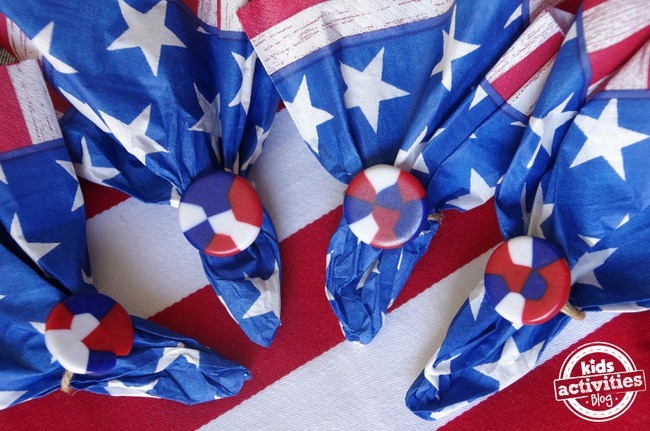 Kids will really enjoy making this melted pony bead American Flag. I used a bread pan as the guide for making our flag. The size of mine, 3 1/2 x 7 1/2 inches, which was the perfect height for fitting in all of the stripes. I used a non-stick pan, but I’ve read that pony beads will pop out of other pans. I had no problems, but if you are worried, go to a thrift store and buy a cheap version. Also, if you don’t have the right size, don’t worry. You can still create the look if you create it in a corner of another pan and prevent jostling as it moves to the BBQ to cook. The kids simply pick out all of the red, white and blue beads. They line them up to create the flag. Little kids may need a little help to get the beads in there straight, but my 3 and 5 year old worked with me to make this flag, and they did just fine. I just would come along and straighten things up every once in a while. I chose to melt my beads on an outdoor grill to prevent getting fumes into my home. There is a slight odor of burned plastic as they are cooking, but I know other bloggers have melted these in the oven and just left the door open to ventilate. Kids can also be playing outside while the beads melt and the house airs out. I cooked these at 400 degrees for 7 minutes. I would start checking after 5 minutes. 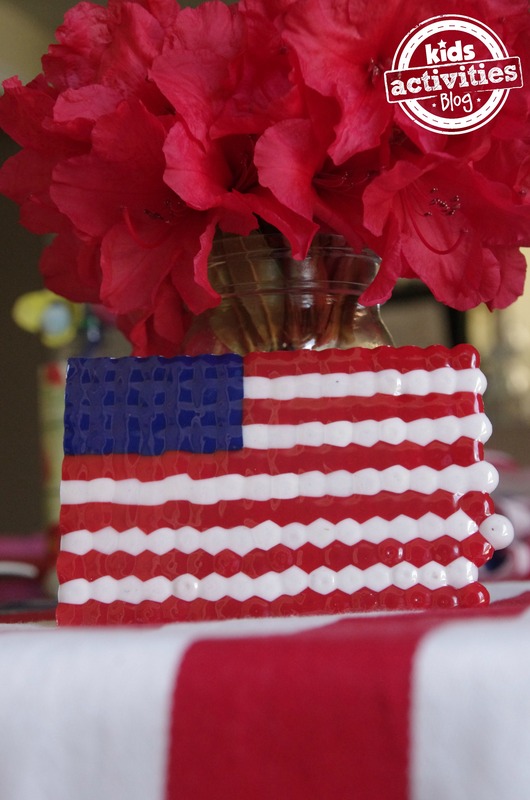 This American flag can be made in a variety of sizes and used to decorate in a variety of ways. I hot glued it to a mason jar filled with flowers. 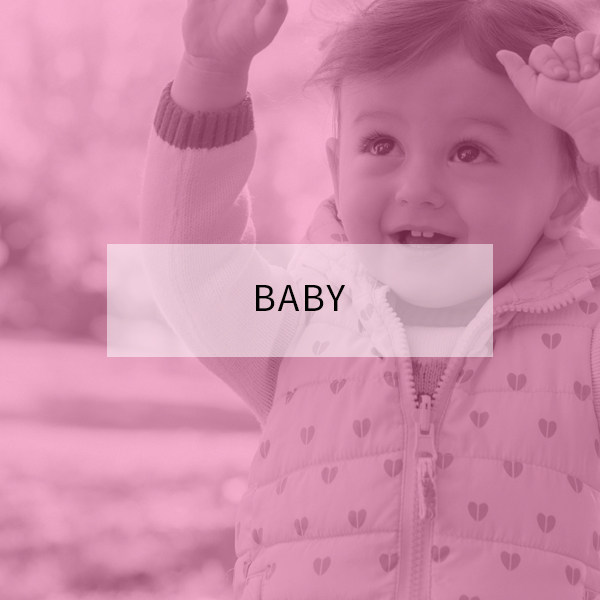 You could make a number of them and create a cute hanging flag garland. 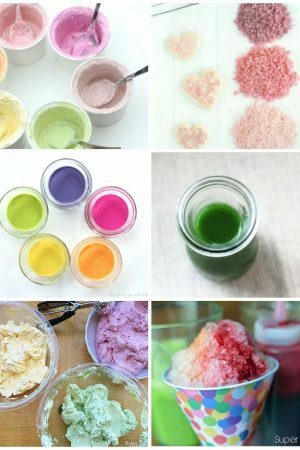 You could make some for decorating a food table. You could use a white paint pen to write names in the blue to use as place name markers on plates. The kids could just put them on a bookshelf in their room too. They’re really cool! 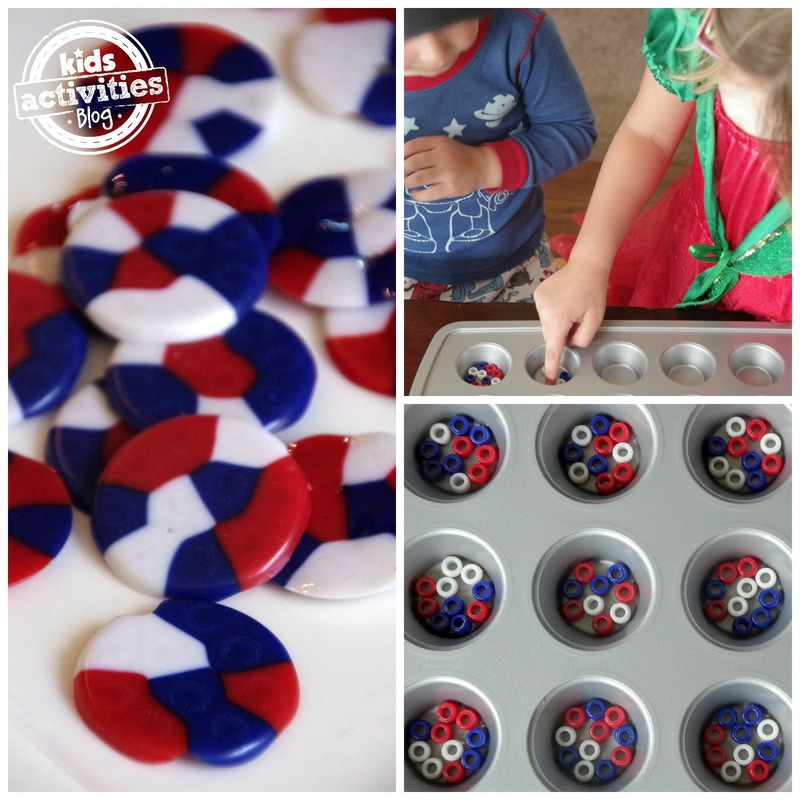 The other thing we made with melted pony beads were these red, white and blue discs we ended up using for a variety of purposes. All you do is fill a mini-muffin tin with the pony beads and cook in the BBQ (or oven…just beware of fumes) for 3-5 minutes on 400 degrees. 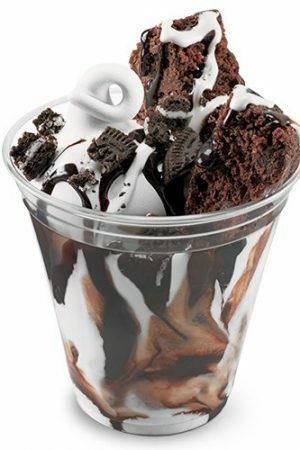 They melt together and create plastic discs that look a lot like poker chips. 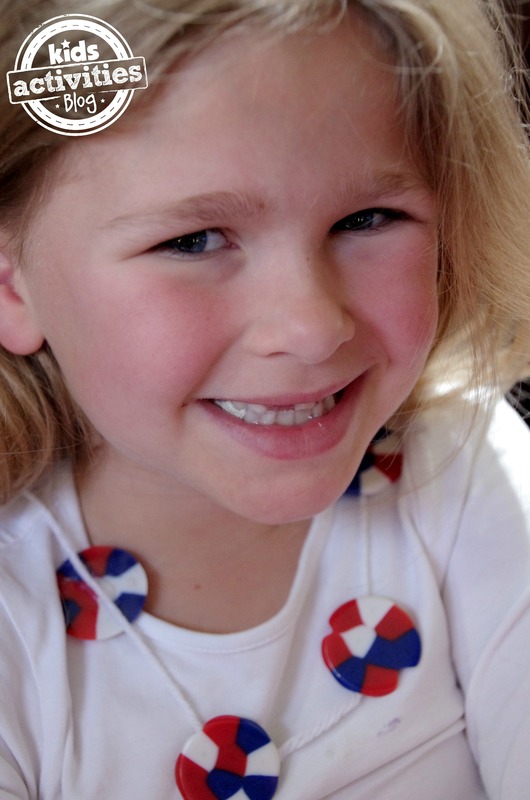 Can you believe kids helped made these cool napkin rings with our red, white and blue plastic discs? 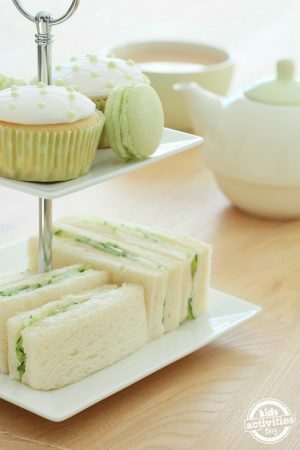 What a fun way to decorate a table or have stacked up for the food table. 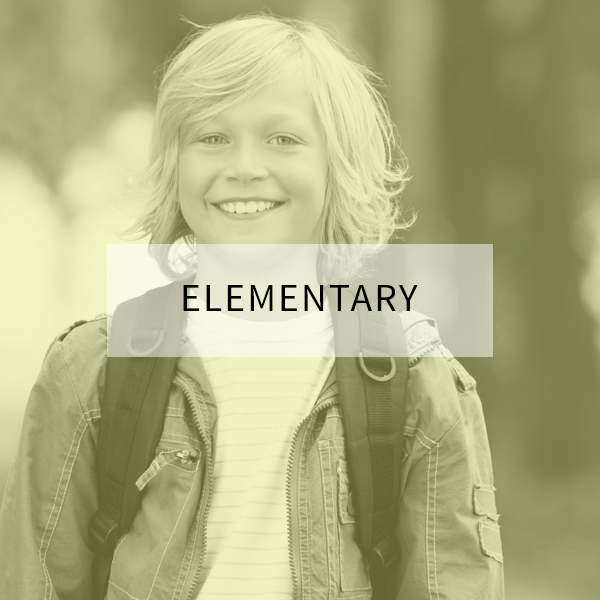 After your kids help make the discs, you attach them to hoops of hemp, ribbon or some other strong string to create the napkin rings. It is as simple as that. 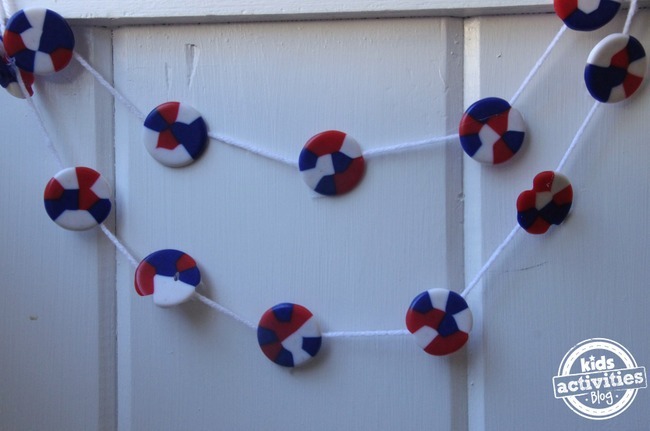 The melted pony bead discs will also make this DIY 4th of July garland. 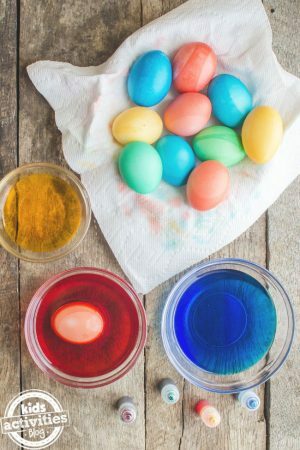 Take the discs your kids made and hot glue them to yarn, hemp or ribbon to create these fun decorations. I used a little bit of tape to make sure the garland displayed how I wanted. 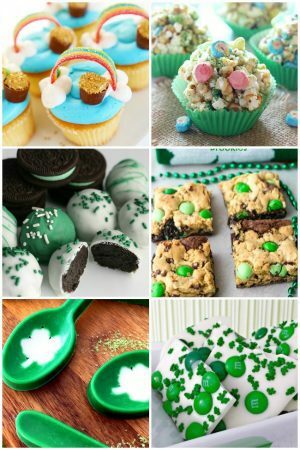 Wouldn’t these look really cool as the decorations for your food table? Just lay down a white table cloth and string these along the front. Why not use these discs to give the kids some accessories too? One idea was to create a hair clip. 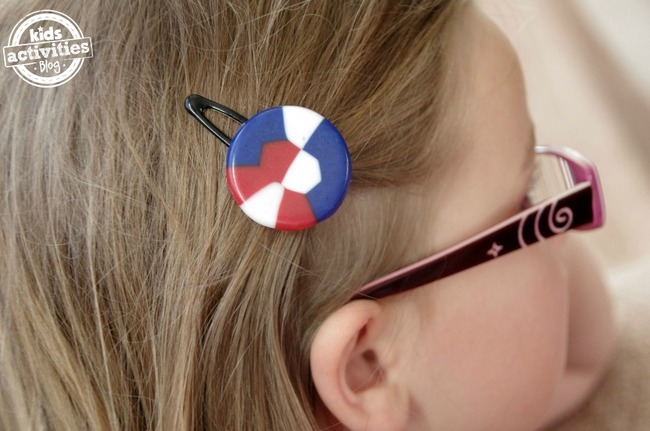 Just hot glue one of your disks onto a hair clip for this cute look. My other daughter thought it would be fun to create a necklace. We just hot glued the discs onto some yarn to complete her 4th of July look. 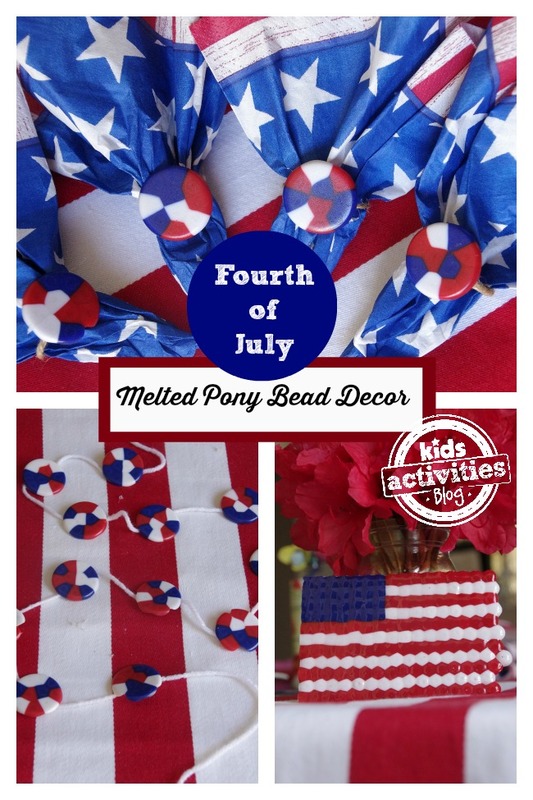 You now have some great decorating ideas to do with melted pony beads for this Fourth of July. 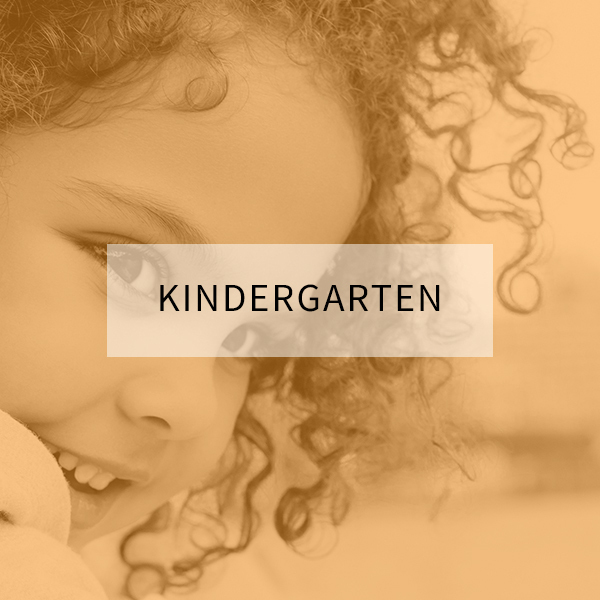 The kids can help and will love having ownership in some of the decorating. 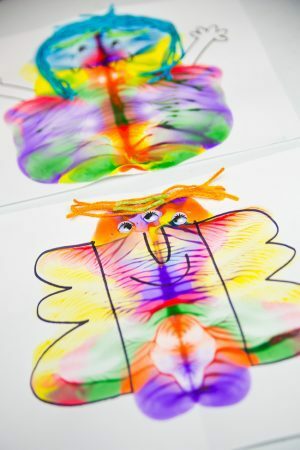 If you want to see some more crafts that would be great for decorating either the kids or the house, I hope you will check out this adorable 4th of July T-Shirt, this magazine flag collage, these popsicle stick flags, and this Crepe Paper Flag.